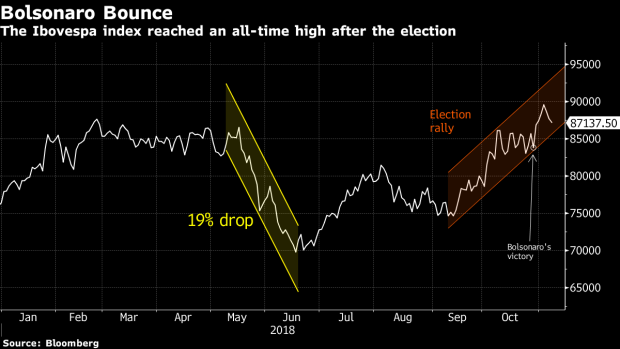 (Bloomberg) -- Jair Bolsonaro’s victory in Brazil’s presidential election has triggered a huge rally in financial markets. The enthusiasm is spreading to bank executives who see a bonanza ahead if the president-elect does what’s needed to fix the economy. Just two years after drastically reducing its presence in Brazil, HSBC Holdings Plc is speeding up discussions about coming back to the local markets and creating a full corporate and investment bank, according to a person familiar with the plans. Citigroup Inc. is prepared to step up hiring for work on the $176 billion of infrastructure investments it expects over the next five years. Itau Unibanco Holding SA, Latin America’s biggest lender by market value, has said it may loosen credit standards given the improving economic outlook. Bolsonaro, a former army captain and little-known lawmaker, has triggered a surge in optimism after campaigning on promises of fiscal discipline, government efficiency and a crackdown on crime. Bankers say a pledge to push through a money-saving overhaul of pension laws shows his commitment to doing what’s needed for Brazil to reclaim credibility among international and local investors. “It was a call for change in the way the country’s led and we have huge expectations on the changes that need to get done,” said Marcelo Marangon, the chief country officer for Citigroup in Brazil. “Every international bank is analyzing” growth opportunities. So far the banking revival has been closer to a trickle than a flood, but there are signs that after years of paring back, Wall Street is testing the waters for a meaningful return. It’s a stark turnaround from the recent past, when the worst recession in Brazil’s history and a national graft scandal sent many banks and plenty of investors fleeing as the country lost its investment-grade credit rating, stocks tumbled and the real reached a record low. HSBC announced plans in 2015 to sell its entire Brazil unit to local rival Banco Bradesco SA for $5.2 billion. The next year, Deutsche Bank slashed local headcount by half and Citigroup moved to sell its retail business as part of firm-wide efforts to cut costs. Many of these banks considering Brazil growth plans had already started to get more bullish on the country, but the election’s outcome gave them another boost in confidence. Executives are wild about president-elect’s pro-market agenda, which some say could help stimulate growth and boost deal activity. His team is evaluating a proposal to grant formal autonomy to the central bank, overhaul tax laws and ease business regulations. Of course Bolsonaro’s goals are ambitious and there’s no guarantee of success. The incoming president has a high rejection rate -- almost half of Brazilians can’t stand him -- partly because of his history of disparaging comments about black people, indigenous communities, women and gay people. But he has comforted investors by saying he’ll appoint the University of Chicago-trained Paulo Guedes as a super-minister in charge of the economy and making reassuring statements about the need for fiscal discipline. Citigroup CEO Michael Corbat visited Latin America’s largest economy the week before the election to meet with clients in a nod to the bank’s commitment to the country, according to a company spokesman. The bank has been investing in its wholesale business to be able to take advantage of any uptick in project finance deals, mergers and acquisitions and capital-markets offerings, country chief Marangon said. Citigroup plans to boost headcount “incrementally” across its infrastructure, brokerage and middle-market businesses, he said. JPMorgan Chase & Co. Chief Executive Officer Jamie Dimon will travel to Sao Paulo for a Nov. 27 client conference as part of a broader trip to other Latin American countries including Argentina and Chile, according to a person familiar with his calendar. Dimon made a similar appearance last year, but the visit this time will give him a chance to connect with clients with a firmer view on the country’s outlook now that election uncertainties have passed. The bank’s country chief, Jose Berenguer, said last month he was bullish on Brazil in part because a Bolsonaro presidency might result in more public concessions and public-private partnerships. Executives at HSBC, meanwhile, have been considering a bigger investment-banking presence once a noncompete agreement with Bradesco expires after 2018, according to people familiar with the matter. The possibility of a return was on the table before the election, but a positive outlook after Bolsonaro’s win provides another reason to expand, one of the people said. The bank said in 2015 it planned to keep a “modest corporate banking presence” in the country and currently employs about 50. An HSBC spokesman declined to comment. Local banks are also considering tweaks to their strategy. Itau may start lending to riskier borrowers, as a robust economy will increase the odds it gets paid back, according to CEO Candido Bracher. “I am very impressed with the first things we are hearing” from the incoming government, Bracher said on a conference call with investors. Still, Bolsonaro will need to constantly affirm his commitment to righting the economy, and once he takes office investors are going to want action as soon as possible. “If we’re able to see the measures being taken in the right direction on the pension reform, on the tax reform, on the political reform, that will bring a lot of confidence,” Marangon said. --With assistance from Vinícius Andrade.